If you are redundant and are trying to figure out what to do with your time, other than job hunt, why not get creative? With creativity you can write, draw, paint, do pottery, create music, make things, and set your mind free. You can also add value to your own life and that of others. Find out more about creativity from the short video below. If you have never watched anything by Sir Ken Robinson or read any of his books, you’re in for a treat. I have spent entire days watching his talks on TED and YouTube and let’s just say if this great thinker was not already knighted I would have started a petition myself! This particular short video is on imagination and creativity. In it Sir Ken Robinson reminds us that in order to be creative you have to DO things. There’s no point in saying “I’m creative because I have a wild imagination” and not actually do something about applying your imagination. Dreaming up things = imagination but applying imagination = creativity. Why Is Goal Setting Like Getting Married? When you are initially made redundant, it can be hard to think about your future, to come up with a plan for it, and to set goals. However, in order to move forward with your life, that is exactly what you need to do. Here is some good advice on how to make goals stick. It’s easy to think that out of nowhere people seem to have overnight success but usually this simply isn’t true. It takes a lot of hard work, determination and persistence to get where you want to be in life and I can tell you that it is worth it. If you click on the blog link below, it explains the steps you must take on the road to success. 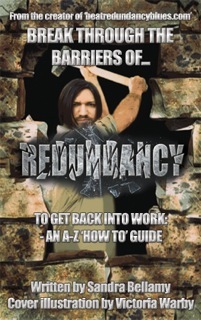 Redundancy can leave you feeling lost, lonely and hurt. Just like when you break up from a familiar relationship, it can be hard to find the motivation to go on with your life because of the pain you feel inside. You need to recognise this as part of the grieving process and start to think of ways that you can make yourself feel better. It is imperative you focus your mind on looking after you. Whatever it is, make time for yourself to do as many of those things as often as possible, at least once a week. The more frequent you do things from your feel good list , the more you will feel positive about yourself, your life and your future. My apologies for not blogging for a while. I have been very poorly with a chest infection and virus and not had the strength to even write. As a writer, it has been very difficult for me not to be able to practice my craft for a while . I am turning my writing website quirkybooks.net into an e-Book store later this year. Amongst the books available, will be ones to help you to get back into work. If I can turn my passion into my dream job, then so can you.